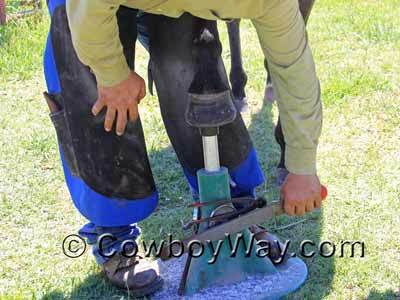 The Hoofjack hoof stand for horses is an innovative tool that holds a horse's hoof so you don't have to. Hoofjacks make lives easier for horses as well as horse owners, farriers, veterinarians, or anyone else who might have to pick up or handle a horse's hooves. 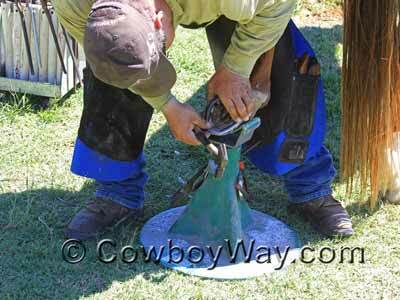 A Hoofjack hoof stand holds and supports a horse's hoof at a comfortable, adjustable height, whether the hoof is picked up and extended forward, or bent backward at the knee or hock. They come in several sizes (with each size being adjustable) to accommodate everything from miniature horses to draft horses. For more information on the Hoofjack please scroll down beneath the Hoofjacks for sale. Below: A Standard size Hoofjack shown with the hoof cradle. Colors: Hoofjacks come in several colors, but color choices are NOT associated to the size of the Hoofjack. In other words, a Hoofjack of any size can come in any color. Sizes: For more about Hoofjack sizes, please scroll down lower on this page. The Hoofjack hoof stand comes in several different colors and sizes. Colors are NOT associated with sizes. The green links will take you to that size of Hoofjack on eBay. Mini - Designed to be the proper height and width to accommodate the hoof of miniature horses. Geriatric - Designed for the horse with severely limited range of motion. Includes a Mini base with a Geriatric cradle and post. The Geriatric cradle will accommodate ponies to small drafts. Medium - The Medium base has the same diameter as the Standard Hoofjack but is 3 inches shorter. 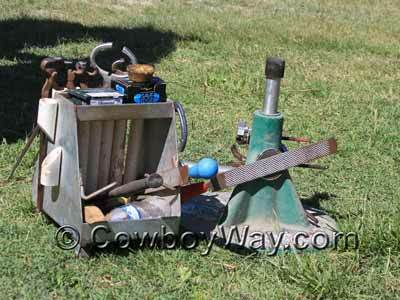 Designed to accommodate ponies up to small drafts or draft crosses (hooves up to size 7). Standard - Designed to accommodate ponies up to small drafts or draft crosses (hooves up to a size 7). If the hoof is less than 7 3/4" at its widest point the Hoofjack website recommends you order the Standard or Medium. 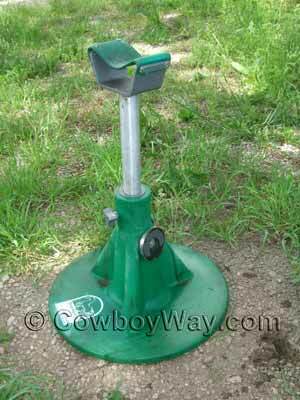 Draft - The Draft Hoofjack has a Standard base with a draft cradle and a post with a draft rubber cap. Combo - Includes a Standard post and cradle, and a draft-sized post and cradle. 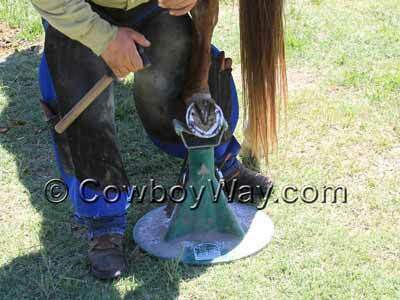 The HoofJack hoof stand is designed to hold and comfortably support a horse's hoof through all phases of trimming, shoeing, treatment, or daily care. It has a wide, sturdy base that supports one of two different included accessories: a post to hold the hoof while extending the leg forward, or a cradle to hold the hoof while bending the leg backward. A knob on the side of the base can be loosened or tightened to easily adjust the height of the post or cradle, and also allows them to be changed from one to the other in seconds. The base of the Hoofjack has two large, round magnets to hold rasps, nails, hoof picks, or other items that may need to be kept handy. Below: A Hoofjack hoof stand with the post attachment, leg extended forward. You can see one of the magnets, facing toward the camera, holding tools. Below: A Hoofjack with the cradle attachment, leg bent backward. The Hoofjack can hold a hoof completely hands-free, and allows the person to change their posture without having to put down the hoof. Below: Another look at the Hoofjack while using the cradle attachment. Below: A Hoofjack hoof stand (on the right) with the post attachment, and one of the two magnets facing toward the camera holding a rasp. Supporting the hoof for daily cleaning. Supporting the hoof for treatment or bandaging. Using the Hoofjack eliminates the need for the handler to put the hoof between their knees (an awkward position for a lot of people). If your horse has the bad habit of leaning on you when you pick up a hoof, let them lean on the Hoofjack instead of you. For some horses, leaning on the handler is a bad habit that should be discouraged or broken. For other horses, such as horses with stiff joints, letting them lean on the Hoofjack can help keep them more comfortable. A Hoofjack has an adjustable height so it can help make horses with a limited range of motion more comfortable. This can help keep the horse, and you, more patient and a lot happier.